April is National Pet Month and we’re Celebrating with a Competition! Why you ask, well sure we’re not a Pet Supply Company, we don’t even have any Pet products in our range, but what we do have is two office Doggos Karma and Tank, who are a huge part of the Ecobin Family – and we know your pets, great and small are a huge part of your family, and that’s a big deal to us. The ultimate xero waste sustainable future we’re all working towards will be incredible, but not if we can’t share it with those in our lives who matter most. We reckon life is all about Heath, Love, Family, Friends a Green Planet AND our pets, now that’s the recipe for a Happy Life and Green Future. You’ve seen we share a lot of happy snaps of Tank and Karma on our social channels, now we want to share the stage with your Puppos, Fish, Kitties, Birds or anything in between. 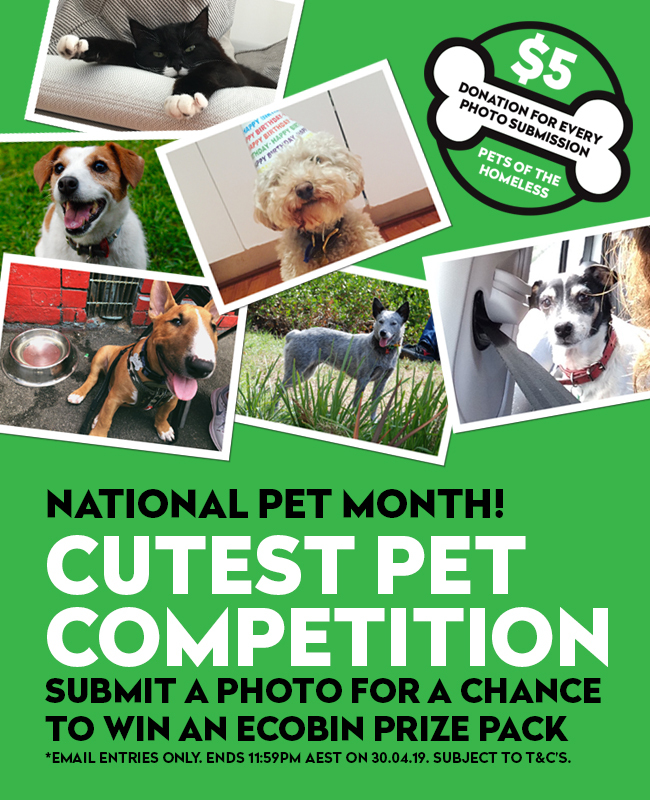 By submitting an entry to this competition you agree for us to share your cute pet picture and answer to sustainable pet ownership on our Social channels during the promotional month. PLUS for every qualifying entry received, we’ll be donating $5 to Pets Of The Homeless Australia, a not-for-profit organisation that works tirelessly to provide food, vet care and other services to pets of the homeless or those facing homelessness. We all know how therapeutic the pets in our own lives are, and this organisation believes that the companionship of a pet in particular to someone facing the challenges of homelessness, can help with self-esteem, mental health, and a range of flow on effects that can support in getting someone back on their feet. So get happy snapping and submit your entry now to be in with a chance to win an Ecobin Pet Prize Pack and help the great work of Pets Of The Homeless.